The Briggs House would have made a daring statement in 1891 when it went up on Broadway as an example of the then newly fashionable Shingle style. 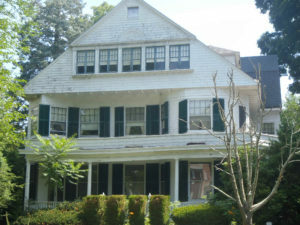 Its low, broad front gable and ribbon windows are characteristic features of the style, which was developed by noted Boston architect Henry Hobson Richardson (1836–96), whose shingled exteriors appeared smoothly taut. The shingles on the Briggs residence were probably originally left in their natural color and later painted white. In 1915 Mary Brewer Briggs purchased the house from Jennie Reid, widow of Adam Reid, founder of Reid & Hughes Co., a department store in downtown Norwich. Mary Brigg’s husband, Lucius, was president of the Chappell Coal Company also in downtown.